Almost all of us have faced this issue, remember? But what we usually did that time is either close the pop-up window that notifies this error or completely close the application that is causing this mistake. But this not an appropriate, as the problem is not fixed and to get rid of this issue permanently you have to explore reason and possible solutions to rectify it. Sometimes it’s programming error in that specific code or script and hence gets fail while running thus popping up an error message. 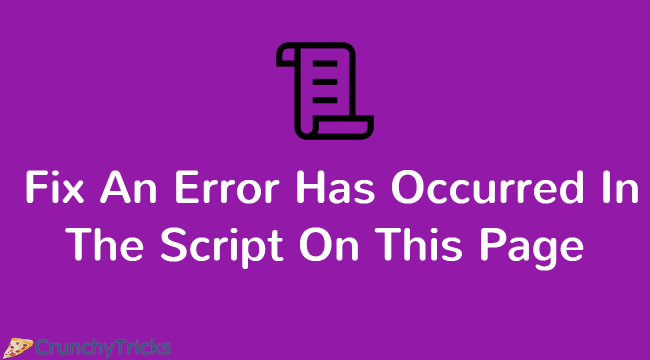 Also sometimes, Windows get crashed due to multiple operations or application being run at the same time (multitasking), and hence when you try to run any software application if it’s code does not get CPU cycle to execute, the script fails and pop-ups error message. Some other possible causes can be Registry Errors. Any Redundant program being installed or its associated files. Click on Start menu>>All programs>>Accessories. Open Run and type “Regsvr32 urlmon.dll” and click OK.
“DllRegisterServer in urlmon.dll succeeded” message will be shown. If the problem does not solve, try 2nd way. Now restart your PC to check if your problem is resolved. Open Run, type CMD into the box and click ok.
Press “Use recommended security” option or click “Ask me Later” option. In extreme right on top, click Tools>>Internet Options. New pop-up window shows up, select ‘Advance’ Panel. Click Apply > click OK.
A pop window will occur asking for Restart, Simply Restart. Again go to Start and select IE option. Click “Use recommended security” option or click “Ask me Later” option. In extreme right on top, click Tools >Internet Options. New pop-up window shows up, simply select ‘Advance’ Panel. Sometimes although you have uninstalled any software application but still some of its associated files which got downloaded along with that software remains in your PC, and you don’t even know about this or ever notice. These files may also hinder some other application or code on your PC from running. So it’s important to delete these unnecessary files which are occupying space in your PC. Open ‘User’ folder and select “Local Settings,” click “Temp” folder and delete all of the files. Navigate to start and select IE option. Navigate to Start and type “msconfig” in the textbox. Click on “msconfig” option from the list. System Configuration dialog box appears. On the Startup tab, look for a mdm.exe file in the list. If found, deselect the checkbox. Double Click on your IE to select for uninstall. Now wait for it to uninstall. Install IE from Microsoft site. If you still getting errors even after disabling them in IE or by Reinstalling updated IE, then there is a possibility that your PC have some adware installed and hence you will need some adware removal software.